PROVIDENCE, R.I. — The remnants of a Russian submarine rest mere feet from shore in Rhode Island, a Cold War relic rusting away. Its fate will now likely be decided by a court. State environmental officials are suing to get the hollowed-out hull of the submarine that was once used as a set for a Harrison Ford movie removed. The submarine, known as Juliett 484, isn't a museum. It's not a draw for divers, either. No one has touched its remains in about two years. 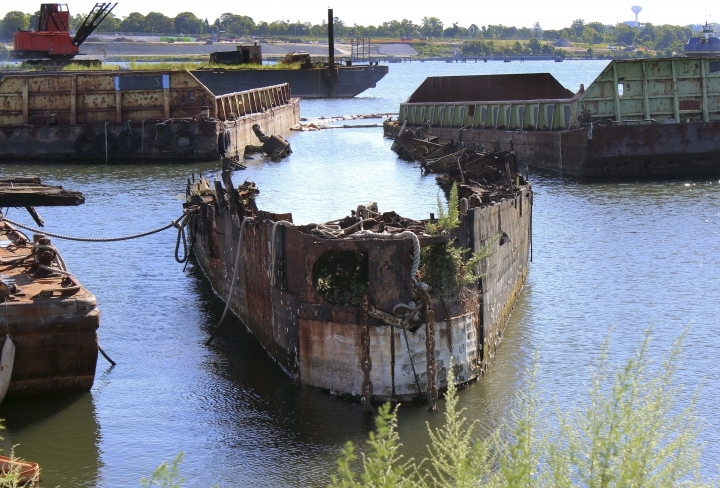 It sank during a nor'easter in 2007 and was sold for scrap. 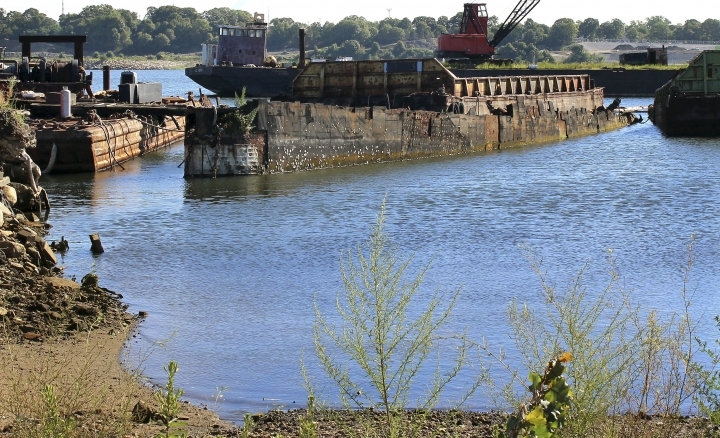 The Providence scrapyard and the property owner are named in the lawsuit by the state Department of Environmental Management seeking to get several vessels removed from the site. The sub, alternatively designated as K-77, and a U.S. aircraft carrier, the USS Saratoga, shadowed each other during the Cold War. 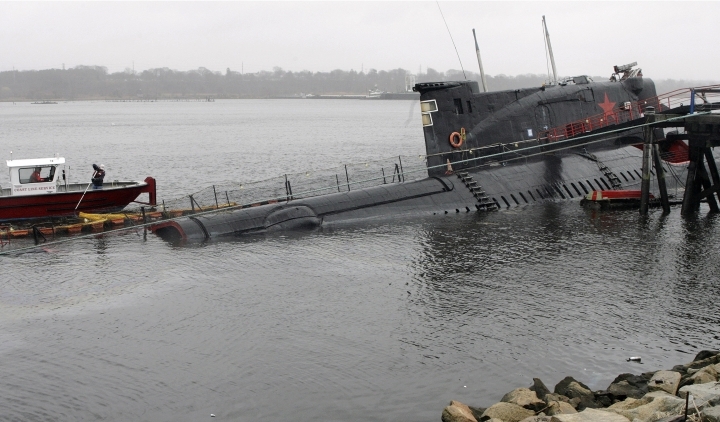 After the war, the sub was sold and used as a restaurant and vodka bar in Helsinki, Finland, in the 1990s, towed to Florida and abandoned, then used as a set for the 2002 Ford movie "K-19: The Widowmaker" before being acquired by the USS Saratoga Museum Foundation in Rhode Island. The foundation docked the 282-foot-long sub in Providence and opened it to the public as a floating museum in 2002. After it sank, the Defense Department raised it and the foundation sold it for scrap in 2009 to Rhode Island Recycled Metals LLC in Providence. It wasn't financially feasible to restore it, said Frank Lennon, the museum foundation president. The company undertook a tedious process to salvage artifacts and remove the interior structures to be recycled, Rhode Island Recycled Metals said. The foundation hopes to put the artifacts in a future museum near Newport on a carrier, the USS John F. Kennedy. Rhode Island Recycled Metals bought equipment to pull the rest of the hull onshore. But the company says the Department of Environmental Management arbitrarily stopped the work in September 2014 and wouldn't approve the plan for finishing the job. The company says it's "ready, willing and able" to finish recycling the submarine. The chief of DEM's office of compliance and inspection, David Chopy, said the company was supposed to dismantle the submarine and other vessels at the site by Sept. 30, 2014, and restore the shoreline by the end of the year, but didn't. The state filed a complaint in Superior Court in March 2015 to compel the dismantling. After a trench was dug to remove the vessels where it wasn't supposed to be, the court stopped the work, Chopy said. The sub isn't in the navigational channel, but the agency worries a hurricane could move it, and it's an eyesore, Chopy said. "We don't want people depositing solid waste in the water, regardless of what form it takes," he said. The property owner, AARE LLC, is also named in the suit. A court-appointed special master, Richard Land, is overseeing the cleanup. Land said Rhode Island Recycled Metals is cooperative and he'll present a plan to the court soon for how all the vessels should be dealt with and by whom. While the sub is owned by Rhode Island Recycled Metals, some of the other vessels at the site are not. The rusting remnants of the old sub are partially sunk in mud. About 60 percent of the hull remains in the river. Today, the Juliett looks like an open metal canoe. "It's like a death in the family," Lennon said. "You're sad, but you get over it and you have to move on."